The Skulls weren't made for a movie like this, and I feel silly giving them out (in a period where half the cliches weren't even allowed, it's a wonder it gets as many as it does). Doctor Henry Frankenstein has made a shocking discovery–-he has discovered a way to reanimate dead tissue, and has created life out of the harvested bodies of the dead!!!!!! Of course you know the rest, but imagine you lived when this was released, when you didn't know. How would it have been to have been around in 1931, and experience these Universal monsters as nothing the world had ever seen? There's something rather magnificent about the movie, something difficult to quantify, but unmistakably awesome--perhaps because it was New, unlike anything that came before, or because it resonates so much in the public consciousness so many decades later. Five minutes into it, I decided I wanted this film-–and all of them! A couple movies later, I didn't want them all anymore (but more on that another time). James Whale and Producer Carl Laemmle Jr. should be commended (and probably have been) for bringing this to the screen. 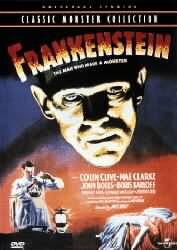 Colin Clive is great as Henry Frankenstein, obsessed but interesting, a "villain" but likable, insane but human. There's a nice moment after he shouts "It's alive!" where one of his colleagues tries to restrain him and says, "For the love of God!" to which he responds, "Now I know what it feels like to BE God!" Fritz, the man-servant with the requisite hump, was well-played by Dwight Frye, a staple of early Universal horror films. I liked Fritz, except for the scene where he torments the Creature with a whip. And then you have Boris Karloff. Of course, the credits list ? as playing The Monster, but hey, this is Karloff's film from the moment we see him. The creature isn't intelligent, but it's not a lumbering, moaning moron-ster as it was in later "Frankenstein" films. In this film, Karloff's Monster is a sad, pathetic animal more than anything else, really tragic. I can totally see kids relating to him, rooting for him, even crying for the poor creature. The black and white of this picture helps me suspend my disbelief in some strange way. It makes the film seem more important (just like subtitles often do), and makes the shortcomings seem less so. The scene with little Maria and the Creature is really cool. Legend has it (okay, it's actually verified, but the phrase "legend has it" sounds good) that the scene where the Creature throws the little girl into the lake was cut from most prints as being too graphic, but that the viewers' imaginations made her death much worse than it actually was. Funny how the mind can do that. So, the scene was censored for 50 years, as well as the aforementioned "God" line, and this is the 1987 Restored Version. Strange, there was a lot of smoking by most every the characters (in fact, even the Creature smokes in Bride, which I find quaint). The shot where the villagers descend on the old windmill is simply amazing. I wonder how they created the burning of the windmill, as it's impressive even today. I enjoy how this film and Bride of Frankenstein fit together as companion pieces, and wish they had quit the series when they were ahead, instead of carting out each Universal monster time and time again until they were so tired they made Freddy and Jason look underused. But it's human nature to do that, and much more forgivable in an era without television or video. Frankenstein is not perfect, though. It was talky-–as these films often were. Were motion pictures a symbol of high society like the theater? Is that why they had such lengthy dialogue scenes? Or were they just showing off their new toy–-sound? The acting is still hyper-realistic and distracting sometimes. The romance seems dull and tacked-on, as they often were in these films. Maybe they still are today. The ending, unfortunately, was one of the weakest moments–-"Here's to a son to the House of Frankenstein!" --remarkably lame for what had come before. I won't go as far as to give it an Unbelievably Crappy Ending, but there are many ways it might have ended that would've been more satisfying (simply fade out on the burning windmill, another trite love scene between Frankenstein and his sweetheart, an indication that the monster still lived, or that Frankenstein would try again, or that he had learned his lesson about tampering with nature, or a coda with the man who stepped out at the beginning giving the moral of the story once again). Still, this film has to be seen, for its historical and influential importance if not for fun. Best Scare: You know, horror films don't always have to scare-–just fascinate, create an atmosphere of the surreal, where anything can happen. Note: Its sequel is remarkable because the filmmakers seem to have taken note of the original's shortcomings and corrected them, creating a film that builds on the foundation laid for it, but adds complexity and improvements to it. Like The Empire Strikes Back, The Bride of Frankenstein is actually a better film than the one that preceded it. Unlike many horror fans, I wasn't weaned on horror but came to it late in life (well, if late means in my twenties). I wonder now what things would have been like if instead of lying on my bed reading highbrow science fiction, I'd have spent my Saturday afternoons and evenings watching old horror. For a long time I've been turned off of the old Universal horror films simply because of their legacy. Anything that eventually goes on to feature Abbott and Costello can't be that good in my book. Quite the opposite has been true, though, as I've 'discovered' these movies later in life. There is a majesty and mystery here that I didn't expect. The monsters often have their own human dignity despite their inhumanity. And the human villains are never quite as bad as we think. Frankenstein was a revelation on these scores. The sadness and nobility with which Karloff played the monster speaks to all those who are mistreated and misunderstood. The passion that Colin Clive injected into the doctor burns like a fever and rather than alienating me, made me feel sympathetic. I wanted him to succeed and when the mistake was realized, I didn't want him to have to put the monster down. With so much less than even the low-budget productions of today, Frankenstein is a compelling story that earns its place in cinematic history. From one devotee of horror to the rest of you, see this movie. Please.